I loved this picture as soon as I saw it. It immediately conjured up a sense of taking a leisurely trip through the mountains. All the while sipping coffee and munching on snacks, snapping pictures out the side window from time to time but mainly just enjoying the surroundings and crisp mountain air. I recognized the mountain peak in the background as the world famous Matterhorn of the Alps mountain range, but didn’t know anything else about what I figured must be a spectacular train ride. Turns out this train is part of the Gornergrat Bahn, a railway that goes to a part of the Alps that overlooks a glacier called Gorner Glacier. 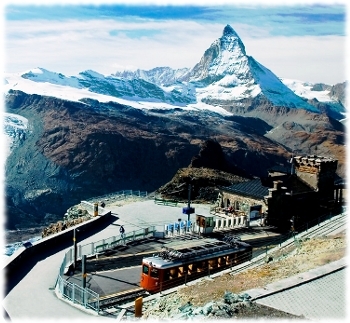 Some people take the Gornergrat Bahn mostly to take in the stunning views, and who could blame them? But once they do get to the station at the top they have the option of getting some other kinds of recreation in as well. A bit of skiing, nice meals at a restaurant, some shopping in at a little mall, and even staying in Switzerland’s highest hotel –the Kulmhotel Gornergrat– which apparently has some cool observatories at the top. For other people the train ride and station is only a prelude to their real adventure. 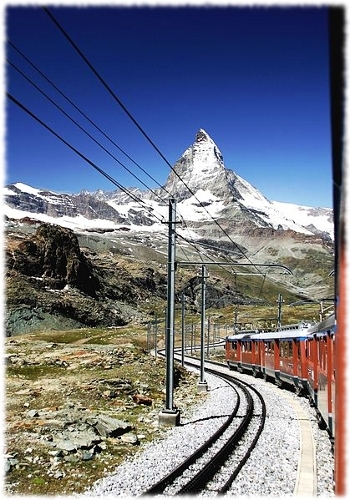 They use Gornergrat Station as a jumping off point for a backpacking trip deeper into the mountains. That sounds like a pretty awesome time to me :D.
The best part is that you’d have a nice leisurely train ride on the way to the station that would help you get into the mindset for backpacking. And on the way back, a nice relaxing train ride to decompress from your adventure and get a last bit of mountain scenery in before your trip is over.